1. Line a 1 liter freezer-proof pudding basin with cling film. 2. Cut the sponge into slices. 3. Cut a small circle of chocolate sponge cake to fit the base then cut triangular pieces to line the sides. 4. Fill any gaps with trimmings and save the remaining sponge for later. 5. Next, drizzle the brandy over the sponge to soak it. In a bowl, mix together the chocolate ice-cream and the mincemeat and spoon the mixture into the prepared sponge base, making a small well in the center. 6. Add in the black cherry pie filling, cover the top completely with another layer of sponge and freeze for at least 8 hours to firm up completely. 7. About 20 minutes before serving, heat oven to 230`c. Whisk the egg whites and a pinch of salt in a large clean bowl until stiff but not dry. 8. Whisk in the sugar, a little at a time, bringing it back to stiff peaks before each addition. 9. Turn the bombe out onto an ovenproof serving dish and remove the cling film. 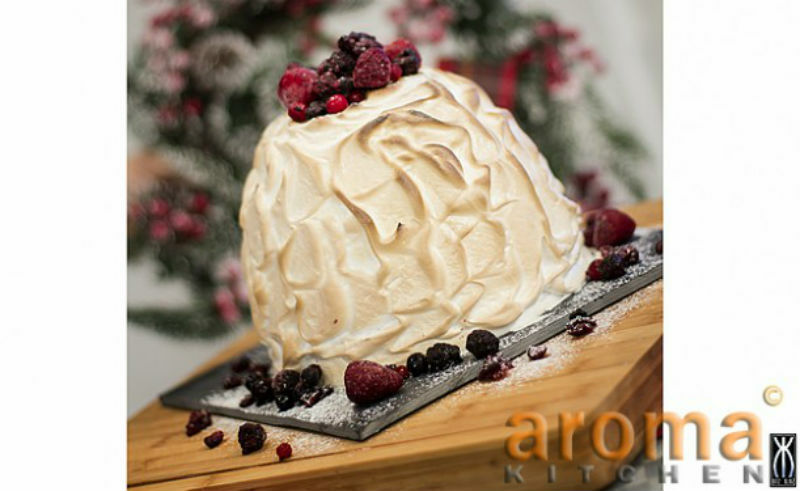 Spoon the meringue all over the bombe to completely seal it. Using the back of the spoon or a palette knife, pull the meringue into dramatic swirls. 10. Bake for 10-15 minutes or until golden. Serve immediately.